Over 3 days/4nights be guided around Mt Taranaki from North Egmont to Ngati Ruanui Stratford Mountain House and then to Dawson Falls. Throughout the 2 day walk you will have the opportunity to view stunning vistas and learn more about the flora and fauna of the mountain. Day 3 will include a walk around the remarkable pest free forested and wetland area of Lake Rotokare before you return to New Plymouth and a soak in the Taranaki Mineral Pools. Throughout you will experience heart warming hospitality and accommodation in unique settings. Taranaki's leading luxury boutique accommodation, the Nice Hotel, New Plymouth, will be your home for two out of the four nights on your trip. You will be welcomed personally by Terry Parkes, the proprietor, or Cathy Thurston who will be your host for the evening. Join Terry for a cocktail and nibbles ( he may even show you how to make your own) followed by dinner and a few local stories . These nights have been a hit in the past ( a night to remember). Or if Terry is away join one of his chefs and experience a lovely wine and food matched dinner. You will also meet your guide for your walk the next day who will give you a briefing about your trip and check you are suitably equipped for the trip. You will then be ready to retire to your beautiful accommodation to enjoy a restful night’s sleep. After a hearty breakfast at the Nice Hotel, you will collect your tasty lunch packs from the kitchen before boarding the coach and travelling to North Egmont. As expected you will have a caffeine fix provided on the way to keep the adrenalin pumping. As you drive up to the start of your walk, enjoy the changing landscape moving from the seaside through rich dairy farming country and towards the lower luxuriant and dense bush of the mountainside. At North Egmont you will have the opportunity to take in the inspiring vistas on the boardwalk and learn more about the mountain and its history in the Visitor Information Centre. Your guide will then lead you off on your walk. From the Information Centre, depending on weather, you will take either the upper Around the Mountain Track or the Curtis. Falls track. Your guide will share their local knowledge, set a relaxed pace and pick the best places for breaks, lunch and photo opportunities. Arriving at Ngati Ruanui Stratford Mountain House you will be met by your host and enjoy a welcoming afternoon tea. Retire to your pleasant accommodation where your bags will be waiting for you. You will have time for a quick shower and change before returning to the dining area. You will sample local produce over a drink and nibbles and your guide will give you a briefing on Day Two. There are also options for a night time experience such as listening for kiwi. Your host will also take the opportunity to outline the rationale behind the ownership of the Mountain House by Ngati Ruanui, (local Maori Iwi). Finally enjoy your evening meal and wine looking out over the floodlit bush and take the opportunity to relax in the comfort of the lounge before retiring for the night. After a leisurely breakfast at about 8.30 am collect your picnic lunch from the kitchen and join your guide for your walk to Dawson Falls. Your route will include the enchanted walk, Waingongoro Track and Wilkies Pools as well as the opportunity to get up very close to the falls themselves. Arriving at Dawson Falls Lodge you will be greeted warmly by your hosts Sera and Markus over a delicious afternoon tea. Hear about the Lodges history and the Swiss chalet connection and what the format for the evening will be. From there you can go to the viewing platform by the Visitors Centre where on a fine day you can see the mountains of the South Island. Alternatively, If you have the energy, you can walk up to the Hillary seat which affords you spectacular views of the South Taranaki landscape. Return to the Lodge where your bags will be waiting in your Swiss style suite for you. After you have showered and changed join your guide in the lounge for a drink and debrief on the day's activities and to hear about the plan for Day Three. Enjoy your delicious meal and wine in the dining area before relaxing in front of the fire or retiring to your room. After a relaxed breakfast, and farewells from Sera and Markus, you and your bag will be collected by your coach driver. Your first adventure for the day will be a visit to the Possum Factory - Envirofur. Here Pennie will explain the process and the uniqueness of what they do and the products available for sale. There is no expectation on you to purchase. The next destination is Lake Rotokare 12 kms from Eltham. 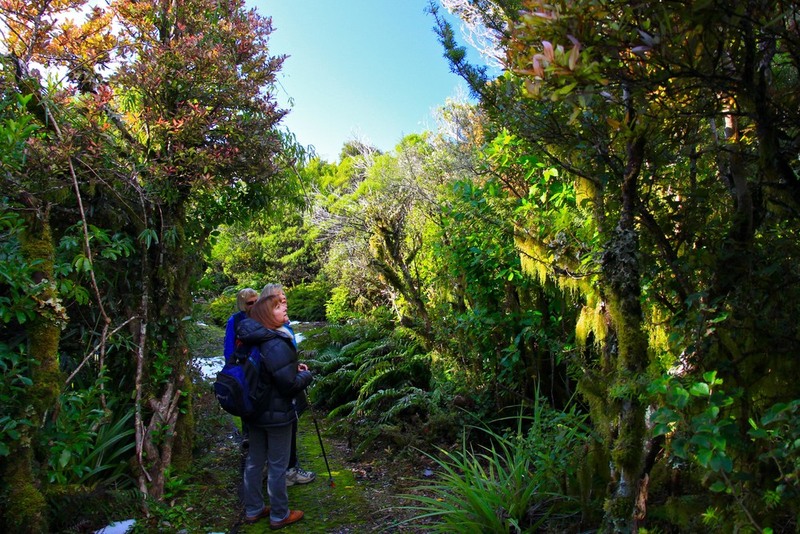 Lake Rotokare, a peaceful and undisturbed bush reserve, is a pest free sanctuary with fabulous bird life. Enjoy a 4.5 km walk around the lake admiring the stunning scenery and bird life before returning to the picnic area where a gourmet picnic, will await you. After your delicious lunch, board your coach for the trip to New Plymouth where you will visit the Taranaki Thermal Spa and have a chance for a well deserved soak. Here you can relax your mind and bathe in 29,000 year old mineral water. You will then be driven to the Nice Hotel to check in for your final evening on the trip. At 7pm meet in the dining room of the Nice Hotel for your final dinner of your experience. This will be the a la carte meal from Table served with wine. Enjoy another restful sleep at the Nice Hotel and meet for a hearty breakfast next morning before you depart or set off for another adventure. In the event of the weather preventing either of the mountain days to go ahead, alternative tracks lower on the mountain will be utilised e.g. York Track, Kapuni Loop Track, Wilkies Pool Track. *A stoat trap will be purchased as part of the tour price that can protect biosecurity and the integrity of the maunga. Don started his extensive career as a raft guide in 1979. His passion for sharing the outdoor world is impressive. He has worked since those early days on 4 continents as an outdoor education teacher, mountain and river guide, outdoor pursuits instructor and a consultant. 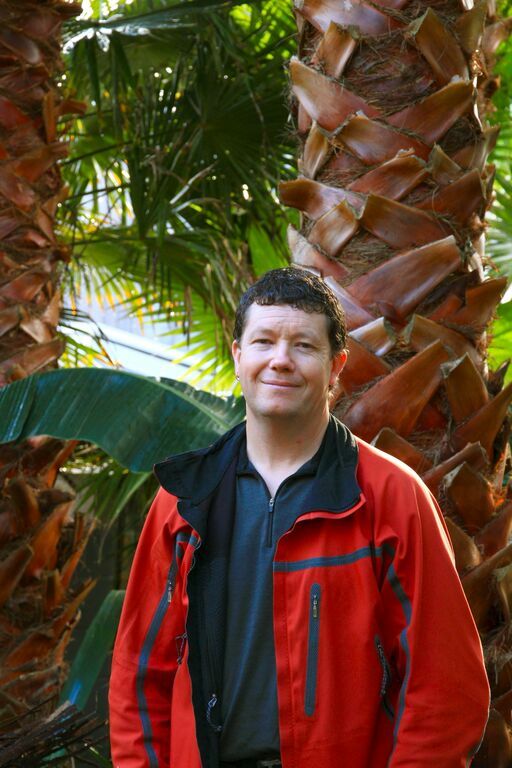 Don is highly regarded in the outdoor industry and has been involved with the development of many outdoor instructor qualifications that are available in new Zealand. Many current instructors have at some stage been trained or assessed by him. Don operates to the highest standards, which ensures that all the work he does is client focused, safe and follows current industry practice. Don kayaks, climbs, skis and runs. He ranks in the top 3 of his grade in orienteering and has recently done well in multisport and adventure racing. Don's qualifications include the highest New Zealand Outdoor Instructor's Association awards. He is a Skills Active Assessor for Outdoor Recreation and Recreation management standards. Don is also a Senior Raft Guide with the New Zealand Raft Association. Christine has been working and playing in the outdoors, guiding and instructing for over 20 years. Tramping, mountaineering and rock climbing are particular passions that have led to many exploration adventures around New Zealand and overseas. She has navigated many New Zealand rivers by whitewater kayak, as well as lakes and coastlines by sea-kayak. Sharing her love of the outdoors has led to her guiding numerous adventurers and novices around Taranaki from the iconic Mt Taranaki tracks to trails that take in picturesque landmarks like the White Cliffs. Christine's qualifications include a Bachelor of Physical Education, an Assessor in National Certificate level 3 Outdoor Recreation including bush, NZOIA Rock II, Kayak I, Sea Kayak I and Assessor and Raft Guide II. Christine is also a Skills Active Assessor. Nick’s first outdoor experiences were with scouts in the Waikato and then in Taranaki. While still at school Nick joined the Taranaki Alpine Club where he learnt to climb snow, ice and rock, was on the club committee for 14 years and was club captain for 5 years. He has tramped and climbed extensively throughout NZ and in Australia. Following assisting in several search and rescue experiences Nick joined the mountain safety council and become an outdoor instructor, trained in bush and mountaincraft and in 1991 was assessed as a MSC mountaincraft instructor. Nick has been an active committee member of MSC Taranaki since joining and the Chairman for 9 years ending 2013. He holds 5 instructor awards, is a national trainer and assessor for NZMSC and has instructed on hundreds of courses over the last 24 years. Nick as enjoyed the personal and professional skill development he has gained with MSC including training with NZMGA guides in the Mt Cook and Westland National Parks, advanced first aid and medic skills and adult learning training. Nick has worked and instructed for schools, polytechnics and several guiding operations over the last 18 years. Nick has been an outdoor enthusiast all of his life with experiences in tramping, climbing, skiing and cycling in New Zealand and overseas. An active member of the Taranaki Alpine Club since the mid 1970’s after completing his first ascent to the summit of Mt Egmont/Taranaki. He has subsequently spent all the years since then climbing to its summit over 125 times as well as tramping, climbing, and skiing its slopes. He regularly climbed in the Southern Alps with Taranaki Alpine Club Trips in the 70’s and 80’s. Nick was actively involved in search and rescue on the high level rescue team in the 1980’s until he went overseas on a 2 year working holiday including a 7 month campervan trip around Europe and the UK. Nick has skied for 40 years in New Zealand, and latterly in Canada Japan, Austria, and Switzerland. At the tail end of a second campervan trip around Europe, Scandinavia and France in 2012 Nick completed a 17 day trek to Everest Base Camp and Gokyo lakes via Cho La Pass in Nepal. Nick has completed long distance cycle rides such as around Lake Taupo and around Mt Taranaki, and regularly cycles Taranaki back country roads. Melanie grew up in the Waikato and spent her summers tramping locally and in Tongariro National Park and the Coromandel. Despite trading the tracks for the beach in her later teenage years, Melanie’s interest in tramping was piqued again in her university years when she joined a couple of international students in tramping the Cape Reinga Walkway. Shortly after university Melanie moved to Vancouver, Canada and subsequently Seattle, USA where she was able to ‘hike’ the Pacific Northwest national parks with the added bonus of seeing the occasional bear. Melanie and her husband have also travelled extensively through Latin America on several occasions. Their most recent trip was with their 1 year old daughter and included two months in Bolivia, where they supported a Kiwi family of mountaineers who train local youth as mountaineering guides to provide them with a source of income. While in Bolivia Melanie and her husband were support guides on several trips in the Andes and summited Huayna Potosi (6088m). Melanie is married to Jared, a Taranaki local, and they made the move back ‘home’ in 2013. Locally Melanie has been involved in leading overnight tramping trips for women and primary aged girls. In her spare time she and Jared are working on growing their two girls (3 and 1) into keen trampers by getting up the mountain on a regular basis. Melanie is self-employed as project manager and works primarily on projects related to corporate social responsibility and philanthropy. Melanie has a Bachelor of Arts in French & Spanish and has been known to teach the odd Spanish class and do a spot of translation work. Melanie has also held roles in operations management, research, business consulting, IT project management and data analysis. Melanie loves to travel within Aotearoa and internationally and enjoys meeting new people. She loves to see others getting closer to nature and enjoying our beautiful outdoors.